The nearly 4,000 square foot home has five bedrooms, three full baths and two partial baths. A sprawling lake home in Saint Croix Falls, Wis., which was previously owned by Kirby Puckett and is still owned by the trust of his former wife, Tonya, recently went on the market for $1.25 million. The nearly 4,000 square foot home has five bedrooms, three full baths and two partial baths. 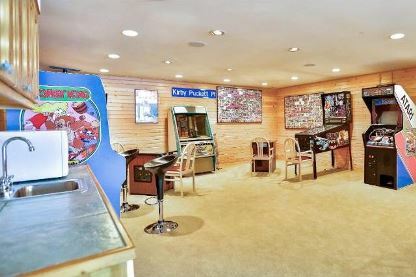 It’s gorgeous, but the best part is the room that has a “Kirby Puckett Pl.” sign as well as arcade games (including Donkey Kong). Now that is a room (picture from real estate site)! Newbie, who discovered the listing quite by accident because his grandparents have a parcel of land nearby, said he remembers seeing Puckett in the area after his retirement. The home has been officially owned by several entities/trusts since Puckett’s untimely death in 2006, which you can note by checking out the address on this county property tax site.